Women on a Mission: Mom Edition: WINE BY THE GLASS! "Recently, my kids and I took a trip to Oregon to visit my mom, Grandma Jewel. My husband was on a week long hunting trip, so rather than risk pulling my hair out and parenting solo, the three of us hopping on a jet plane and headed west. My mom lives in an average sized town in Oregon, an hour north of Portland in the heart of the Columbia River Valley – wine country. There are a number of wineries along the valley and beautiful vineyards around every corner. My mom and her husband even grow some grapes and combine them with a neighbor who bottles the wine. New to her town is a renovated wheat mill called Sunshine Mill named after Sunshine Biscuits, originally created at the mill. The original structure had the milling equipment built right into the building itself. This massive equipment, all powered by electric motors designed by Thomas Edison, still exists in the building today. The new design is formed around this equipment in an attempt to preserve historic design. I’m kind of a nerd for historical buildings, but there was something even more cool coming out of Sunshine Mill. Cut to Copa di Vino, loosely translated meaning “wine by the glass.” This cool concept created by winery owner James Martin, was crafted after something he saw in France while on vacation; wine sold in individually packaged glasses. 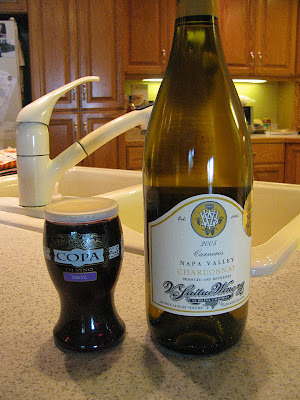 Copa di Vino is single portioned glasses of wine bottled right into a 100% recyclable plastic container. There’s no separate glass needed. And no pesky corkscrew either. The patented package is even wine glass shaped! Each generously portioned serving is a cheap $4. They are available in single portions, or in a package of 12 – mixed or same variety. How’s that for thrifty? So check out their website or facebook: http://www.copadivino.net/. Copa may not be available in your area, but it’s available online. Who knows, you might see it in your area soon – I have a feeling word will travel fast on this cool product!"